The team of attorneys at the Blanch Law Firm focuses on representing white collar crimes including tax evasion and tax fraud. There are some important differences between tax attorneys and criminal attorneys. While tax attorneys are helpful in matters regarding settlements and compromises with the IRS, criminal attorneys have both the courtroom experience to defend tax crime cases when trial is imminent and the ability to litigate settlements. The Blanch Law Firm’s team has litigated on behalf of clients undergoing audits, some of whom owed the IRS millions of dollars, and has represented clients in federal court. To learn more about types of criminal tax practices, visit our Fraudulent Practices page. The Blanch Law Firm is a boutique white collar criminal defense firm based in Manhattan. Our attorneys comprise a combined 50 years of experience and hail from a variety of backgrounds on both the prosecution and defense sides. Some of our attorneys have graduated from the nation’s top four law schools and have worked as prosecutors for district attorney’s offices around the nation. 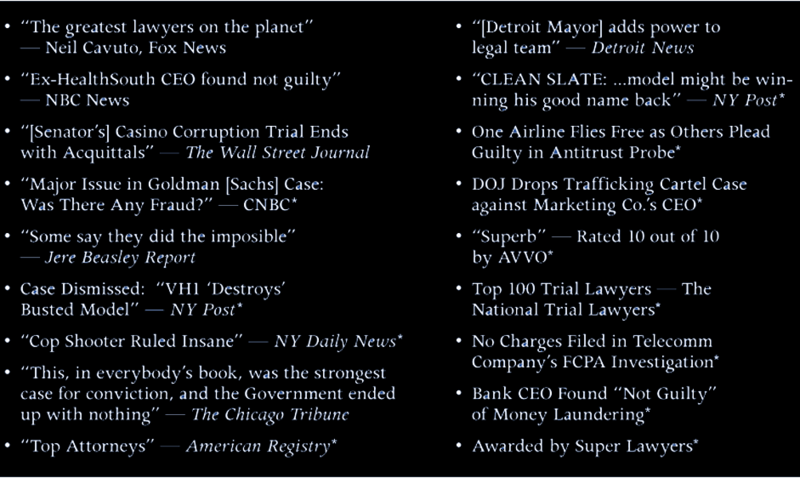 Over the years, we’ve obtained phenomenal results whether in trial or in pretrial plea agreements. Our team has fought for and won many dismissals and has achieved multiple sentence reductions. To learn more about us or to schedule a consultation, visit our Contact Us page.